"If you're looking for a unique ice cream dessert, this is it. It's perfect for get-togethers on those warm summer days. And it's very easy to prepare." Melt butter in a large saucepan over medium-low heat; remove from heat. Add rice cereal, brown sugar, coconut, and pecans; stir well. Pat half the cereal mixture into the bottom of a 9x13-inch baking pan. 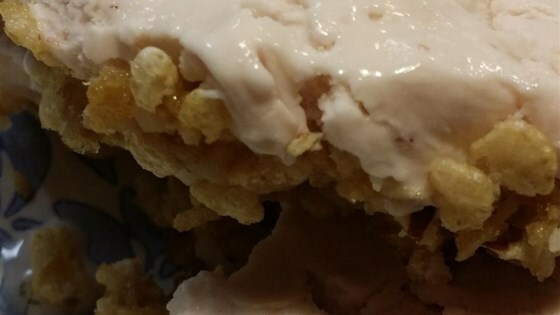 Cut slices of ice cream and spread on top of cereal mixture; layer the remaining cereal mixture on top of ice cream layer. Place in freezer until set, at least 1 hour. Cut into squares when ready to serve. Just in time for summer! See how to make quick, simple strawberry ice cream. Awesome recipe! Making it was so simple, and delicious! This was so simple and really good! An easy way to make ice cream just a bit more special! I can't wait to play around with different ice cream flavors with this!